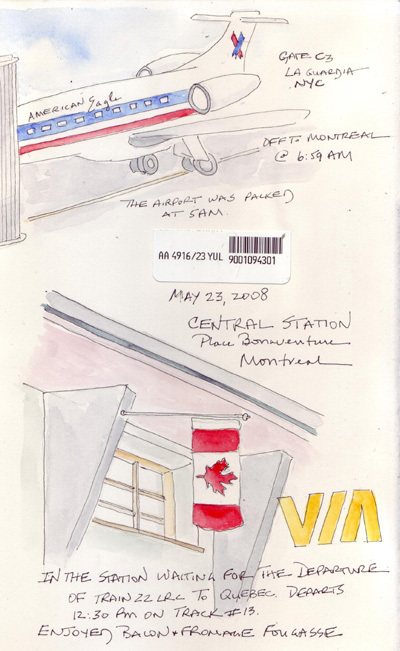 These are the last of my selected sketchbook pages from our days in Montreal. In total, I have uploaded approximately two-thirds of the pages that I completed - and filling the entire 36 page recycled sketchbook thrills me. I have connected with old friends and new friends planning to visit Quebec Province this summer and even received emails from EDM members who are just planning a trip. Because Domenic started a thread on the Every Day Matters Message Board re: sketching while traveling with a non-sketcher, I tried to add some notes about when and how I sketched during this trip - bottom line = FAST. That means that nothing would ever be considered a finished painting, but I have wonderful memories of a fabulous, relaxing vacation in two cities that I only previously read about. 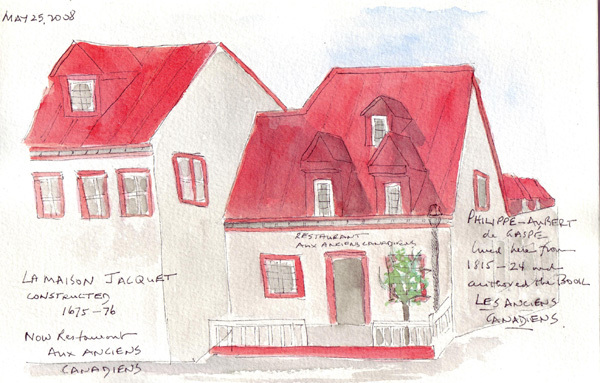 I sketched Pointe a Calliere from the steps at Place Royale while my husband was at the hotel gym late one afternoon and painted it from photos back in the hotel at night. It was the most challenging architectural sketch I did - and there was lots of erasing before I was satisfied. This point along the St. Lawrence River is the site of the original settlement of Montreal and the History and Archeology Museum was constructed on the site. Archeologists are still actively "digging" underneath to identify the original buildings and to save artefacts in the Museum. Our last night in Montreal we returned to Modavie, a restaurant on rue St-Paul that has live jazz. I sketched the singer and the band quickly while we waited for our food - which was lucky because they took a break that didn't end until we were almost ready to leave. The singer returned from break with her jacket on so I sketched her a second time while finishing my coffee. They were painted using my small travel paints and a Niji waterbrush while we were at the restaurant. A double page spread didn't fit on my scanner, so this is a photo. On our last morning in Montreal we took a final, very long walk around Vieux Montreal, following a lovely walking guide I purchased at Point a Calliere. We saw most of these streets and buildings previously, but the Pierre du Calvet House was a new, wonderful discovery. 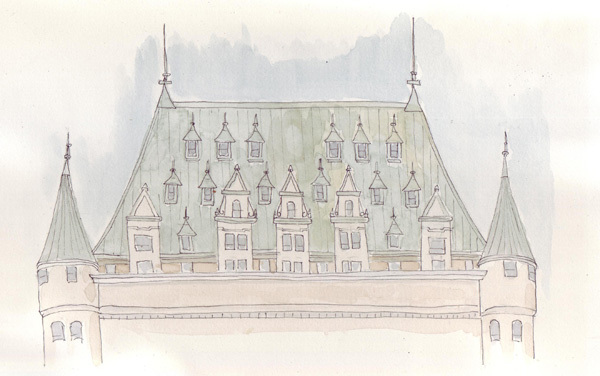 I sat on the front of Marche Bonsecours to sketch it while my husband went in for a few minutes. When he returned, he took a photo of me finishing the sketch. 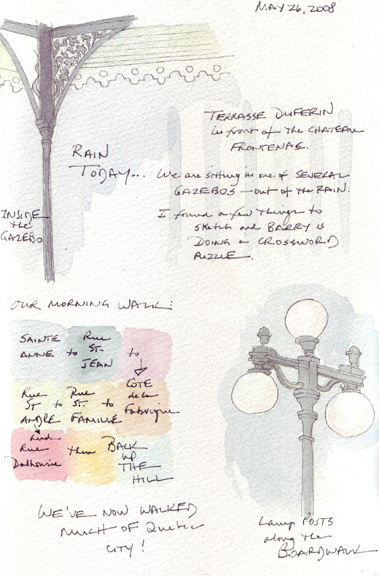 I used Arches and Fabriano 140 lb watercolor paper in this sketchbook and I'm disappointed in the yellow tinge to the background of the scanned sketches. The backgrounds on the Fabriano 140 lb extra-white CP paper are almost white, but I didn't like using the CP paper as much as the HP. I'm most familiar with this scanner and my Moleskine watercolor paper - and I couldn't take the time to investigate my scanner settings this week if I wanted to upload the travel sketches before my vacation is over and work beckons. It was fun to share my sketchbook with the EDM members who inspire me with their world-wide travel and art. Thanks again for your blog visits. 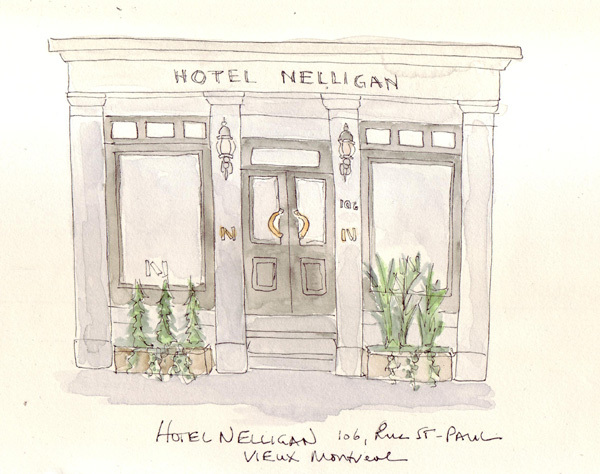 We took the train back to Montreal and checked into the lovely Hotel Nelligan - a boutique hotel in Vieux Montreal. 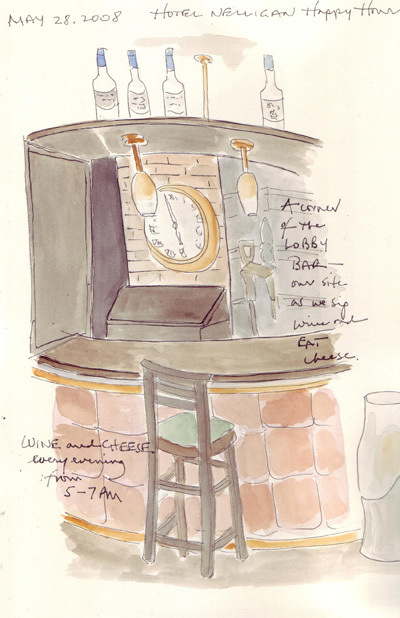 We arrived just in time for "Happy Hour" in the lobby so I documented our arrival with a sketch of the lobby floral arrangement while we were sipping our wine. The following day we walked all the way to rue St-Catherine at rue Guy to see the Central area of Montreal - and then back again. We were in search of hockey jerseys in childrens' sizes and princess clothes for our grandchildren - making it a fun walk past all of the stores on St-Catherine. 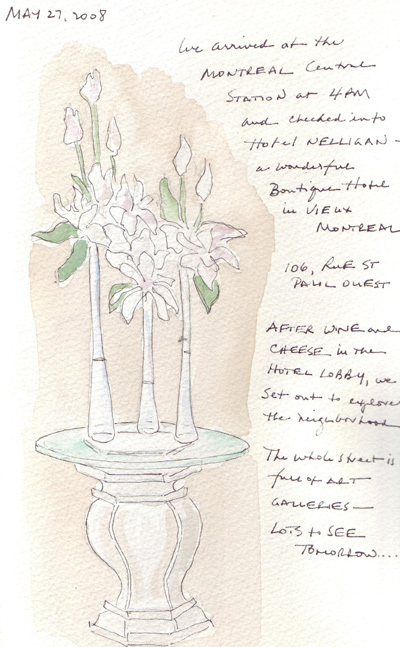 But we were happy to re-enter Vieux Montreal and I stayed outside a few minutes to sketch the door to the lobby of the Hotel Nelligan. I sketched flowers during our first evening Happy Hour and from a seat in the lounge sketched the bar during the second. There is still a lot I have to learn about establishing 3 separate planes in a sketch - but this is all about practice! Suzy, an EDM member from Montreal, suggested that we might enjoy seeing the Avmor Art Collection and I made an appointment with the Collection Director for a private tour during our visit. Mr. Morrow started an industrial cleaning product company on rue St-Helene in Vieux Montreal in 1948. 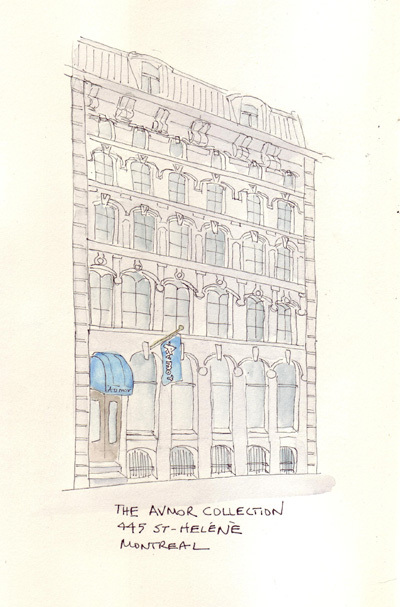 In the 1960s he commissoned an artist to do a drawing of the building for the company Christmas card - starting what would become many commissions by many different artists in many mediums. They now have nearly 400 works of art, all inspired by and depicting the Avmor business headquarters. They have since moved the industrial part of the business to Laval, but retain 445 rue St-Helene for the Avmor Collection. 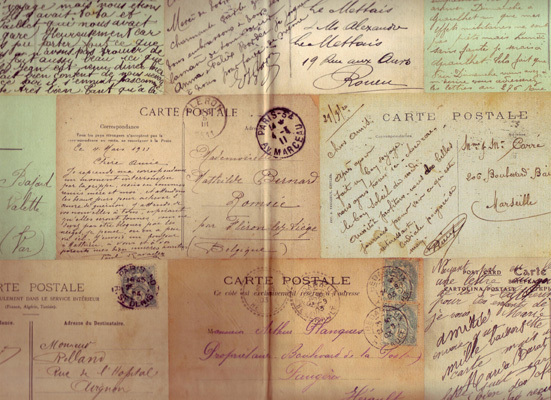 The hours that we spent touring the extensive art and memorabilia collections were among the most pleasureable of our entire vacation thanks to Marie. 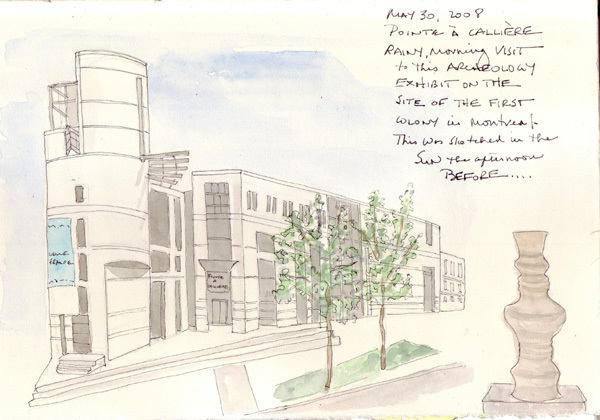 We walked by the building the day before our visit and I did a sketch before seeing any of the Collection. I thought this might make other artists' interpretations even more meaningful to me. After a walk and some gallery browsing, we stopped for lunch at an outdoor restaurant with jazz. 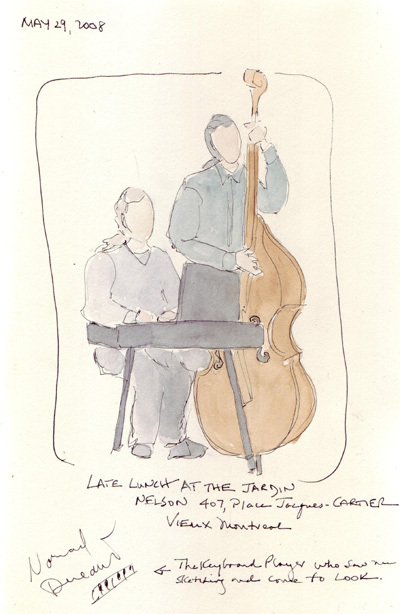 While waiting for our lunch, I quickly sketched both musicians and was then surprised by the sudden appearance of the keyboard player at our table to see what I was doing. 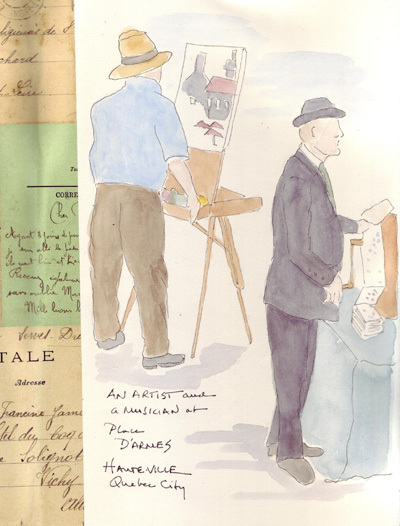 We were across the courtyard from them so I had no idea that he even saw me sketching. He was really nice and even agreed to sign the sketch. As he returned to play the 4th set, he stopped by to tell me that now I would have time to add faces! Rain arrived in Quebec City on our 3rd day and we did our big walk through the streets (haute-ville and basse-ville) with umbrellas. But we definitely didn't want to spend the rest of the day in the hotel. 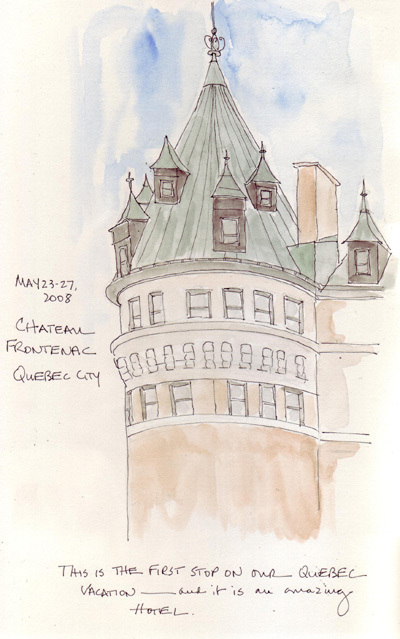 The gazebos along Terrasse Dufferin, on the top of the cliffs, provided wonderful shelter from the rain and allowed me to sketch and my husband to do one of his New York Times crossword puzzles. I sketched what I could see from inside of the gazebo and painted it while we were there. The color squares map our walk that morning. I decided that I don't like Fabriano CP watercolor paper, but had to forge ahead and use these few pages. When we got too cold to sit any longer we went in search of onion soup gratinee and salad. 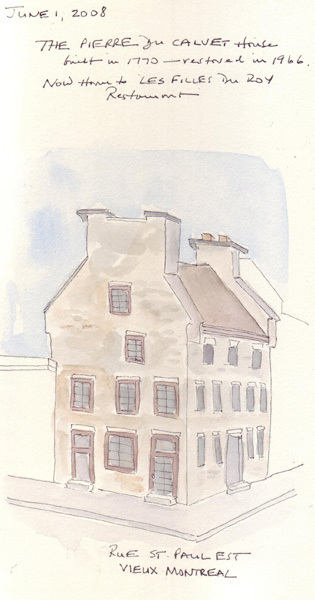 I sketched the following "oldest house in Quebec" (Maison Jacquet; built in 1675-76) in the sun the afternoon before while my husband was at the gym. 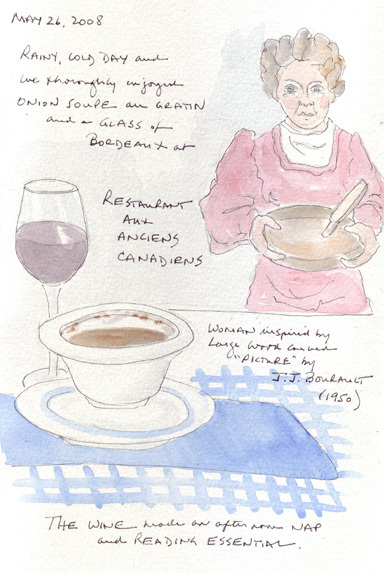 It is now a lovely, cozy restaurant named Aux Anciens Canadiens in honor of a book written by Philippe-Aubert de Gaspe who lived in the house from 1815-24. So it was a perfect place for lunch. During lunch I sketched one of many figures on a large carved wooden picture above our heads - and then used artistic license to add color to her. I also sketched my husband's soup bowl after the thick layer of cheese was consumed. The painting was done later during a quiet moment. 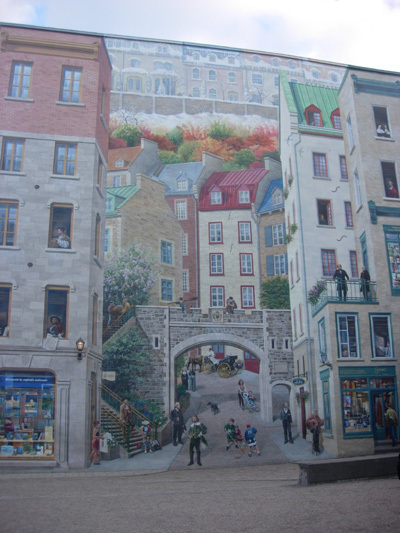 One of the buildings near Place Royale has an enormous fresco painted on the entire side of the building - depicting all of the historical figures important in the settlement of Quebec City. The figures are life-size as drawn - and it is a challenge to take a picture while students aren't posing at the bottom amidst the famous folks. 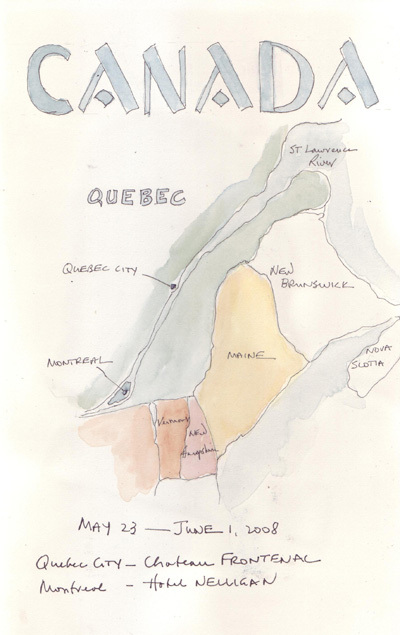 Exploration of Basse-ville: We wandered down the hill from Chateau Frontenac, not using a map, nor the funiculaire, nor the "breakneck steps," and found Rue St. Paul - a wonderful street of galleries and antique shops. On the way I quickly sketched a few items in gallery windows that we passed (sketched in pen quickly and painted later). We spent time in multiple galleries and found some new contemporary Quebec artists that we liked. On rue Sault-au-Matelot we visited an Inuit Art Gallery to learn more about the "Dancing Bear" sculptures in the window and then visited Musee de la Civilisation to learn some Quebec history. 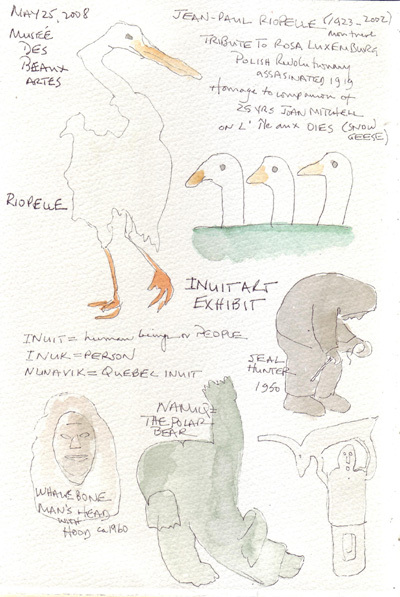 My sketchbook page from the museum visit has more writing than sketching as I learned about Quebec (page not included). The following day we walked through Parliament Hill area to the Musee de Beaux Artes where we discovered two Canadian artists. 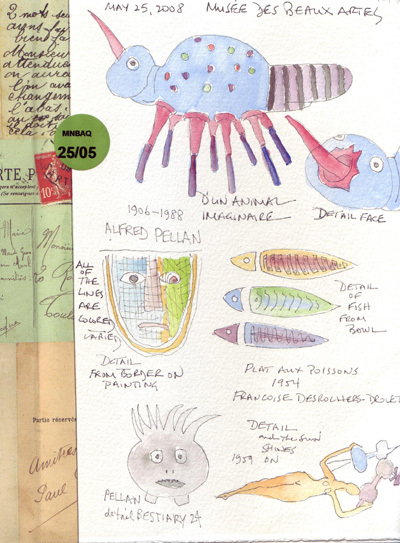 Alfred Pellan has many imaginary beasts in the permanent collection, including the large garden sculpture sketched here and a children's exhibit and workshop. 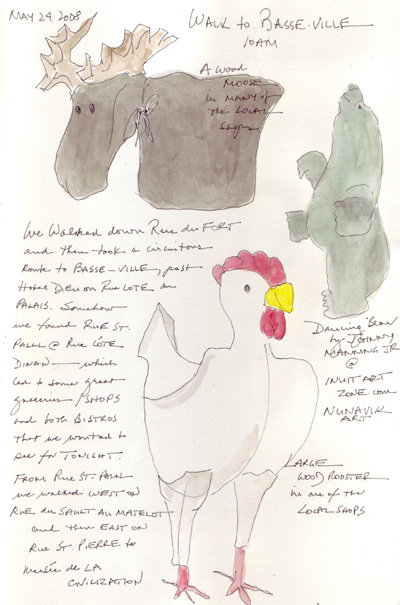 All of the sketches on these two pages were done in pen as we walked through the exhibits and painted later. Jean-Paul Riopelle created a massive, haunting mural (Homage to Rosa Luxemburg: more than 30 huge paintings all strung together) in which he uses spray paint and stencils for many, many types of birds on Ile de Oies. It was beautiful, but also upsetting as I thought about dead Snow Geese and other types of birds being used to create so many images. 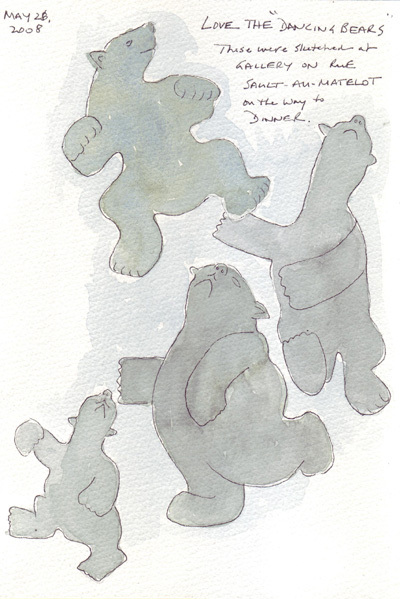 We also learned more about Inuit Art touring the Museum's Brousseau Collection and I sketched a few more Inuit sculptures at the Museum and several whimsical dancing bears in the window of a gallery on our way to dinner (we were 10 minutes early for our reservation). These bears were all sculpted from serpentine rocks and then highly polished by Inuit artists in Nunavik (Quebec Province). There were many performers in Place D'Armes and around the entrance to the Funiculaire. 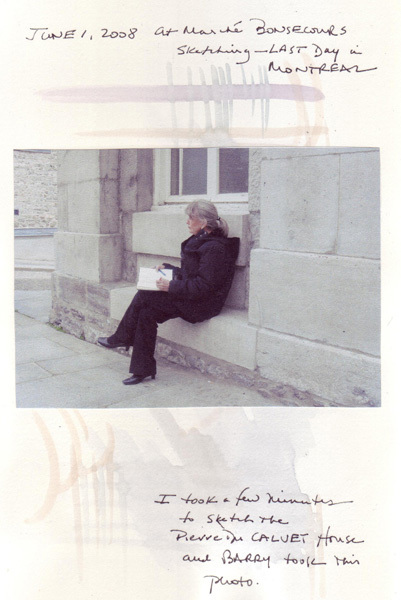 I took photos of some of the more interesting ones and later used two to sketch this artist and musician. 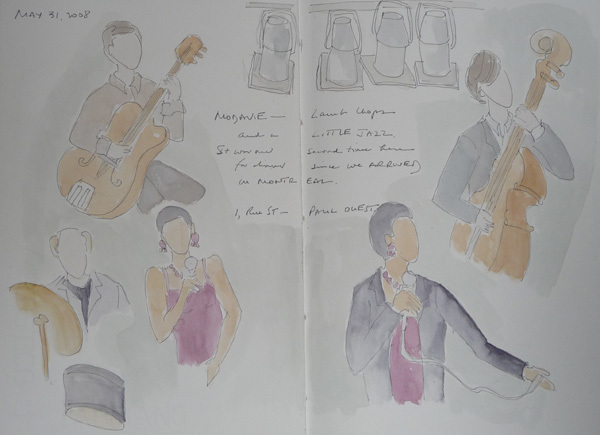 It would have been difficult for me to sketch them without being very conspicuous - even the photos felt rushed. I had time in the early morning to sketch from my photos on our laptop so this worked well and allowed me to practice quick figure drawing (one of my Art Goals for 2008).